On January 20th, Wired published an article reporting the results of a pilot study jointly conducted by Apple and Houghton Mifflin on the impact of iPads in a middle school classroom. 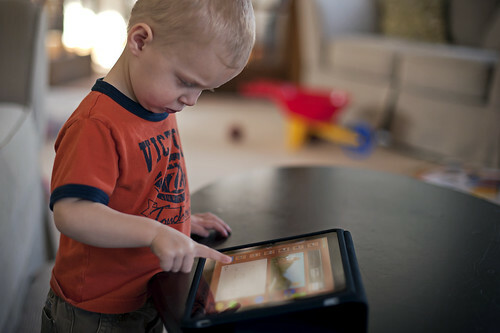 The title (“iPad a Solid Education Tool, Study Reports”) reflected the optimistic and surely-not-conclusive need for digital supplements to enhance educational outcomes. To keep it brief, the study basically put iPads in the hands of middle schoolers and told them to read their algebra textbook using its interface. 78% of the students who were given iPads tested at proficient levels or higher in algebra, compared with 59% of those who used the traditional textbooks to learn. A 19% spike? Surely this justified a call-to-arms for Apple, which has gone from 1996, when Steve Jobs said that education could not be fixed with technology, to 2012, when the company unveiled its new educational initiative by launching iBooks 2. Except that the study was flawed in its design. Think about it. If I gave your students a shiny new toy to play with and told them to read a textbook on it, how much more motivated would they be to engage? Now make them middle school students. When I was in middle school, if I were given the opportunity to read my science textbook on the ‘newly released’ Xbox or GameCube, then surely I would have read the relevant pages as soon as I got home from school. The heightened performance, then, had just as much potential to be the result of a transient sense of novelty as it did from iPad’s interface and design. The lesson to learn from this is not just that a study’s design should be vigorously scrutinized, though that certainly holds merit for all research. But we should all take a hard look at how technology SHOULD be used to help education, not just what it CAN do. And the answer to this lies in principles of education, not of technology. After all, the way it is defined, technology arises from knowledge, and the soundness of that knowledge is what I am calling into question. Should we be creating e-textbooks? Maybe. More rigorous studies may indeed find a rise in comprehension of concepts through the use of e-readers, but even then we wouldn’t know if the results are based on the novelty of the product used. And we should always be striving for results in education that aren’t contingent on novelty, but on the ways we learn and motivate ourselves as a species. I know that anytime someone brings in ‘the essence of the human experience,’ he could lose readers, but stay with me. I’m talking about a renewed focus on what both students and teachers value, and how technology can appeal to them. The natural response to this would be: ‘but then aren’t e-readers appealing to students’ senses of novelty a good thing?’ But novelty is not necessarily what students value in a learning environment. I conducted some interviews last year with teachers in my old high school as part of an independent project, and some of their insights resonated with me as a student. According to them (and existing theories on learning), not all students are the same, but they can be classified by type. One group of students values learning something they can apply out of the classroom. Others will value anything that gets them a good grade. Finally, we all know the students that value maximizing their leisure time and doing the least amount of work possible. Let’s look at the iPad textbooks through this lens. Of these groups of students, who values the iPad textbook as a learning tool? The presence of the content on an iPad does not make students any more likely to apply the content outside of the classroom. The pilot study may make it seem like the iPad solution improves grades, but as has been shown, this is inconclusive. And students cannot hope to read words any faster on an iPad than in a book to maximize their leisure time. In these same interviews, I learned that teachers value the student-teacher relationship and student engagement with the material. Technological aids present a possible contradiction here: they may increase engagement while creating barriers that affect the student-teacher relationship. The best learning solution for technology, then, is one where the technology facilitates engagement and understanding while keeping students (and teachers) relatively oblivious to its existence. What does this mean in real life? Take the Khan Academy as an example. In a recent interview with Charlie Rose, Salman Khan spoke about how he believed concepts could be imparted without bells and whistles, but simply with enthusiasm and a coherent teaching module. The use of YouTube to share Khan’s lessons does not pull focus from the lessons themselves, which may be part of the reason why the Khan Academy has received international acclaim. The greatest mistake we can make is to think that by implementing any technological solution, we are saving education. Enthusiasm for technological solutions in education should always be bounded, and collectively, we should work towards technology that may align with student and teacher values.